Bear's Hearth | Bread, love, and other essentials of life. Bread, love, and other essentials of life. Some sites and books I use and love. I am a bad punster using the same source material twice, but I couldn’t resist. I’m also going to warn that this post is going to be light on pictures, so I’ll try to make the next one prettier. Part of what I love about baking is that there’s still a lot of new things for me to learn — new techniques, new ingredients to play with, new ways of using old ingredients. And once I learn something new, I have lots of ways of learning how to use it. This week, I decided to try making crackers, which looked a lot like making pie crust, which I enjoy and am getting pretty good at. Plus, I needed something to make for my team meeting at work and I’d brought brownies the week before for a potluck. I decided to go with something more savory-snack-like. 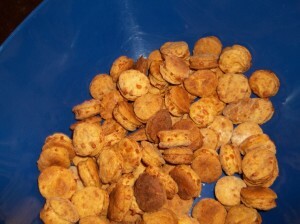 Specifically, something that sounded sort of like homemade Cheez-Its. OK, so not really four-and twenty. That would be entirely too much chicken for one pie, and one pie is really all I tend to have energy and room for. 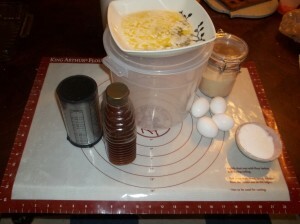 I started out this week planning to do just the orange rolls for the blog post, but then I realized that a lot of that process is pretty much identical to making cinnamon rolls, so you get a two-in-one: Chicken pie and orange rolls. Dinner and dessert you might say. 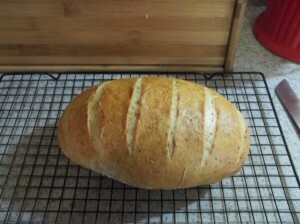 People seem to love homemade bread. Period. Full stop. I’ve got several theories as to why. Some of them have to do with knowing what’s going into your body. Some of them have to do with the sheer bliss that smelling bread baking seems to bring to people. Still others have to do with people thinking it’s hard and feeling touched that you’d make it for them. I used to be in that latter school of thought myself. 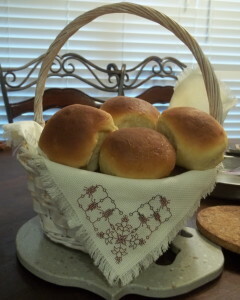 Then I started baking and was amazed at how simple most breads are. It’s more sweets this week. Or at least half sweets and half something that could be turned into sweets. 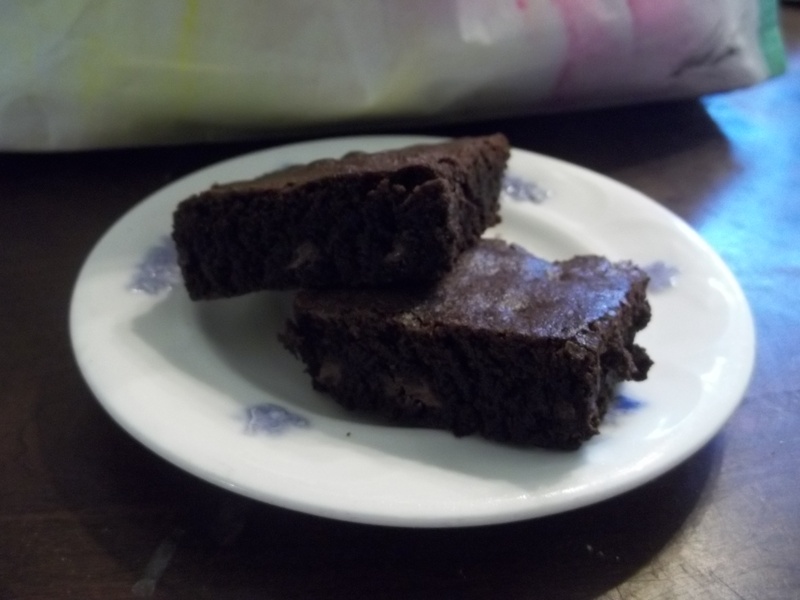 The first half are my dark-chocolate thoroughly sinful brownies. 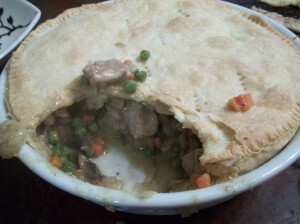 The second half is pie crust, which I haven’t actually tried to make anything sweet out of yet. 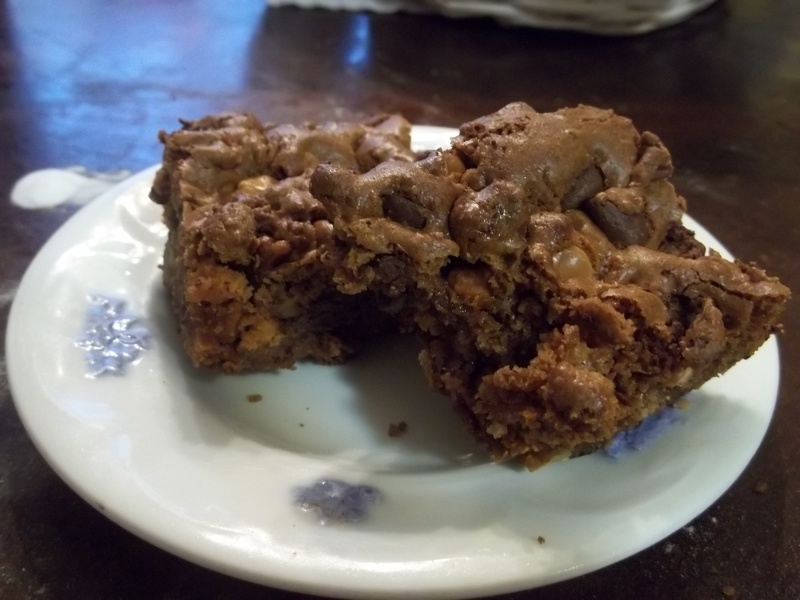 The brownies are my own recipe, something I’ve fiddled with until I’ve come up with something that I’m happy with and that people seem to enjoy. Some recipes were just a little too gooey. Some were far too cake. These seem to come out just perfectly fudgey and dense. Do You Know the Muffin Bear? This is another week for sweet treats. Muffins and blondies, specifically. My original intention was to do some blueberry muffins, but the last batch were not met with as much enthusiasm as I would like. Plus, Courtney can’t have the blueberries. Her gastroparesis means no skins on the fruits and GERD means no citric acid. However, pumpkin is considered as super-food for people with GP and the Basement Elf suggested pumpkin chocolate chip when I was musing on cinnamon chocolate chip muffins. Get These Cinnamon Rolls Away From Us! 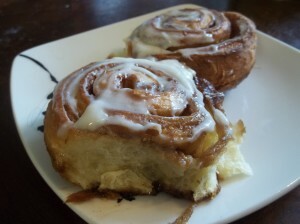 Cinnamon rolls are one of those things that I didn’t think I’d ever have the chops to make. Those and croissants, and I’ve made both now. The first time I made them, it was a complete spur-of-the-moment thing. I had brioche dough. I had sugar and cinnamon. And, the main ingredient in this kind of experiment, I was bored and had time on my hands. I cobbled together the filling and frosting from several different recipes that I used to figure out the method before doing it my way. After that first experiment, I was asked to please only make these for special occasions. Since that first batch disappeared in about a day and a half with four people eating them, I can see why that request was made. We really are trying to eat more healthily, even if I have a carb-making addiction. Hawaiian Sweet Bread is Sweeeeeet! This week is going to be another compare-and-contrast. I’ve got a pair of recipes for this bread, one that I’ve made pretty successfully a couple of times and one that this will be the maiden voyage for. The first method is one from Facebook and the other is from BBA. Hawaiian sweet bread is, well, sweet. And bread. And soft. And pillowy. And gorgeous. It is also a favorite of my ‘other momma.’ My mom and her older sister live together, being ‘two old widder women’ as my aunt says. The two of them shamelessly mother the entire combined brood of kids and grandkids. I try to make yummy things for them to take over when I’m able to go visit. 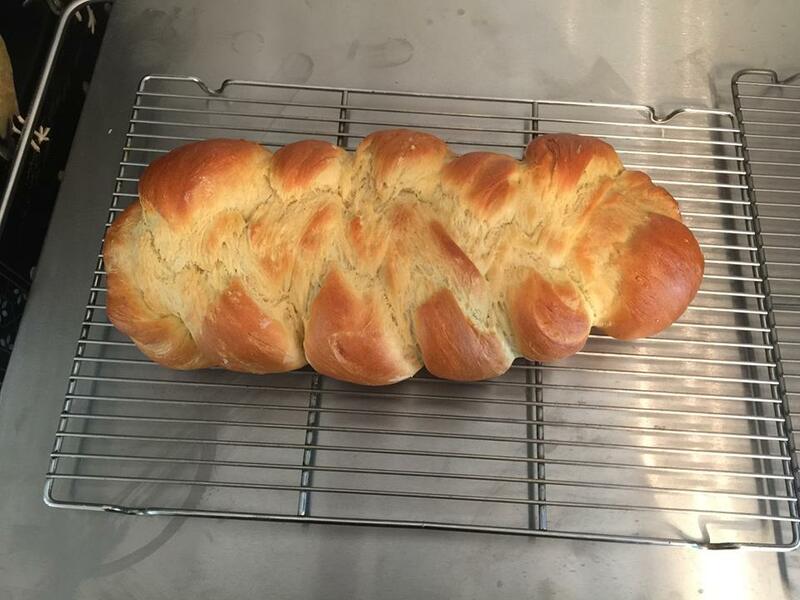 I Ain’t No Challah-Back Girl. We have a problem with puns in my house. Well, no, we don’t. No one has a problem making puns. It’s just that there are rather more made than I’ve been led to believe happen in the average household. Not that we’re average. But I digress before I even start. I didn’t grow up eating challah, just like I didn’t grow up eating bagels. 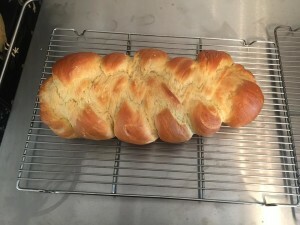 And, just like she did grow up eating bagels, one of the housemates did grow up eating challah, so she’s been my sounding board on this stuff from day one. She’s told me several times that what I make is as good as or better than any she had at holiday feasts when she was younger. It’s also about a million times less complex than I expected it to be. Some of that is due to the recipe I use, some of it is the fact that I grew up with a sister who had hair down to her waist. You learn to at least do a rudimentary braid pretty early on under those circumstances. Most of the work in bagels turns out to be in the first day. Once everything is all risen, the boiling and baking goes like gangbusters. On day two, I got all the stuff together for toppings. Feedback on those has been that everything is yummy, but since one housemate has some serious restrictions on seeds, there should be less seed-based bagels next time and about three times as many Asiago cheese bagels. 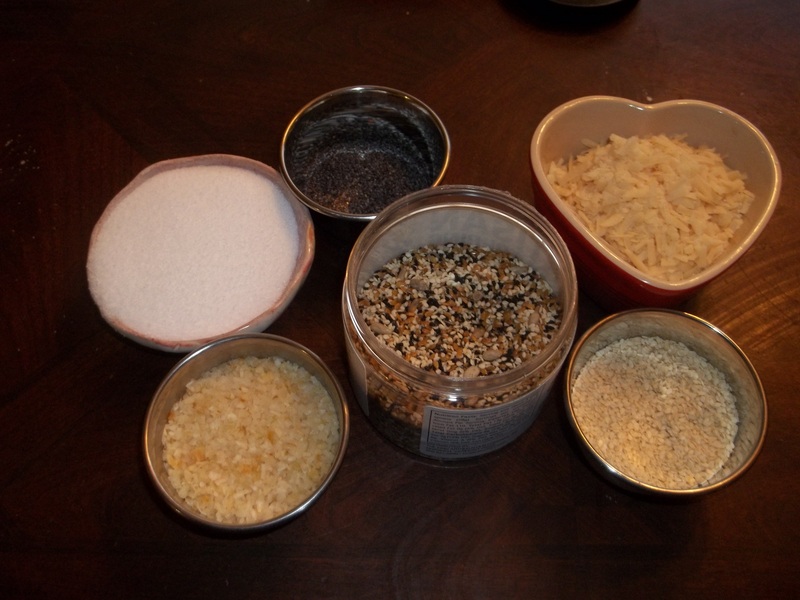 To the right we have, clockwise from upper right: kosher salt, blue poppy seeds, grated Asiago cheese, sesame seeds, Artisan Bread Topping , and rehydrated dried minced onion. The bread topping, onion and salt were combined to make my version of an everything bagel. Those came out the prettiest of the bunch. Laughing Collie on People Wanna Cracker. Waya Ricker-Bell on People Wanna Cracker. Laughing Collie on Do You Know the Muffin Bear?